The Be You! Tree: the official newsletter of my school, SMK Bandar Utama Damansara (3). Mooted by our beloved principal, Puan Azizah Yusoff; it is a quarterly publication which covers any ongoing school event. It is the companion publication of the School Resource Centre blog, and is run by the Publicity Subunit of the School Resource Centre Prefect Board. Currently, the newsletter team consists of the other administrator of this blog and I. I am in charge of the designs and the other person is in charge of the articles. Sadly, most people don't agree with him being the journalist as his English is a little too good. If he wrote the articles, I don't think half the school population would understand what he is saying, including the teachers. After the examination, Diana and I got busy with planning to set up the subunit itself. We brainstormed for ideas, and listed them all down. This became our first letter to Puan Tan Soa Tiam, and in hindsight, it was quite full of original ideas, and is very influential in the direction it is taking now, such as its affiliation with the blog, creation of a Facebook fan page and input from normal students. This letter I have appended due to its length, but it is nevertheless worth reading. By the 17th of September, we have started advertising for input into the newsletter, which is detailed in the aptly-titled blog post, ‘The Be You! Tree’. It basically marks the true start of the newsletter editing . This I have also appended due to its length, but its spirit shines through as clear as day. In 2012, Puan Tan Soa Tiam was replaced with current (at time of writing) School Resource Centre Coordinator, Puan Sabrina Mohd Rafiai @ Ismail. By then, it is displayed in the designated notice board for students to read, but instead of being monthly, it was semi-annual. As it was Diana’s year to face the PMR examinations, she had to put her responsibilities on hold. 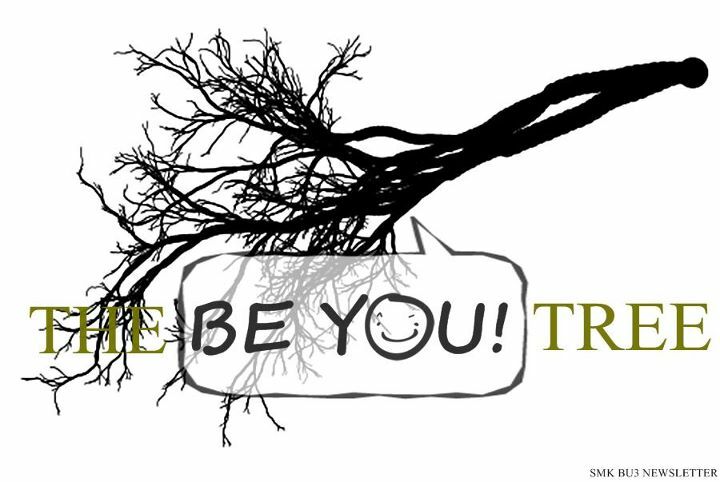 Since the whole undertaking was a bit tedious, the whole concept needed a rethink, so by the end of the year, The Be You! Tree underwent a makeover; with a new mast head, a new concept and a School Resource Centre logo revamp. Shedding the rigid sections, it centred solely on articles written by students for students, about events in the school. In 2013, the project was brought into joint venture with the school Editorial club, with the newly-named Bulletin Subunit collecting articles, and the Editorial club managing the design. From that, it was then first syndicated throughout the school. During School Resource Centre Week, it was mentioned in the principal’s opening speech in joy. The articles from this first issue were put up on the blog. Later on, articles are derived from the School Resource Centre blog. The blog itself had evolved from being a casual medium of sharing to being an official source for news and events in schools as well. Originally founded on the 31st of July, 2011 as a virtual camp fire to recount experiences, the blog slowly started to cover school-related events in 2012, which involved the School Resource Centre Prefect Board, such as School Resource Centre Week, Wind Band Concert and the PMR Examinations. In 2013, it started to grow in that direction, culminating in the creation of the series of farewells from the 2012/2013 High Committee, before reaching its climax in the Highlights of 2011-2013 series and the Student Highlights Series which grossed 1,770 views in August; thus making the total overall views of the blog to 11,854 views as of 7:36 PM on the 13th of October, 2013. Starting of the 23rd of May, the blog posts are also syndicated to The Be You! Tree Facebook fan page and Twitter account. These were revamped to now belong to the School Resource Centre. With this strengthening of a digital base, content from The Be You! Tree becomes more accessible to the masses, and the printed issues continue to be displayed on a designated notice board. As I retire this year, with two years of experience, I hope this subunit, with the usage of a variety of mediums will continue to achieve the paramount mission of the Library: to make itself an agent of dissemination of knowledge and information. 1. We would like our subunit to be named ‘Warkah’ noting that the other subunits in the School Resource Centre Prefect body are named in their Malay names. We also would like to name the newsletter, ‘The Be You! Tree’ and design the logo that would show that it is part of the School Resource Centre. 3. We would like to request for a box to be prepared so that we may receive any suggestions or submissions for the newsletter. This may be placed anywhere that is near the library. 4. We would like the newsletter to be affiliated with the School Resource Centre Blog, so that we may too receive suggestions via the blog. A dedicated page on Facebook could be set up for the same reason. These are our suggestions as of now. We would consult you if we have any inquiries or more suggestions for the subject matter. If you have anything to say to us regarding the newsletter, please do not hesitate to tell us both.